The 2011 Ford Mustang GT doesn't look much different than the 2010 on the outside. But underhood? The return of the 5.0-liter V8! Only now it's making 412 HP and 390 lb-ft of torque with an expected 25 MPG. There is no discussion of the 2011 Mustang GT without discussing the return to a five liter V8. The 5.0-liter, or 302 as it was known in the pre-liter era, has become irrevocably tied to the Mustang, when the 4.6-liter was introduced the Stang-faithful praised the improved power delivery but moaned over the loss of their favored displacement. This time the fans get their five liters AND a whopping 412 HP and 390 lb-ft of torque. The power comes courtesy of an all-new clean-sheet design which started in only 2007 and sliced 12 months off the normal engine development project without sacrificing any of Ford's durability and quality testing. What they've come up with is a laundry list of nifty goodies. Beginning at the block, the all aluminum unit is designed for light weight and high-power durability. The forged steel crank is factory counterbalanced and clamped to the block with cross-bolted four bolt mains which, if you aren't keen to that kind of thing, means a potential for huge power. The connecting rods are a forged powder metal design with floating pins retaining hypereutectic pistons, each with their own oil squirters to keep things lubed and cool. Those are important as this engine is a high-compression design and employs active knock supression so keeping the pistons cool to prevent predetonation is important. The mandate for the 5.0 team was maximum breathing for this engine and it can be seen in the design of the heads. The initial thought was to strap heads from the Ford GT on the engine, but they didn't deliver the power targets so all-new aluminum heads were designed. The heads are designed with race-inspired vertical intake ports to improve flow.The four valve heads use a dual overhead cam pushing a simple roller-finger valvetrain with automatic hydraulic adjusters. Those cams on both the intake and exhaust sides are part of the good stuff on the engine though, featuring what Ford calls "Twin Independent Variable Cam Timing" or Ti-VCT, which to the rest of us not constrained by copyright laws call variable valve timing. The front of each cam shaft holds a mechanism which uses engine oil as an incompressible fluid to hold the cams, leaving the shifting duties to the inertia in the shafts. The new 5.0 ditches the valley-mounted alternator in favor of a low-mounted long-runner intake for good low-end grunt. Maximum torque comes in at 4,000 RPM but the entire curve is nice and flat. This new engine pushes the redline for the Mustang V8 up to 7,000 RPM, with maximum horsepower arriving at 6500. The engine is paired with Ford's new 6-speed automatic and new the Ford/Getrag 6-speed manual, both shared with the V6 model. Despite the new engine borrowing an old theme, the 5.0 is an engine designed for now and into the future. Though it's still a port-injection engine, it's projected to make 17 MPG city and 25 MPG highway, oil changes have been pushed up to an impressive 10,000 miles between changes using 5W20. It delivers a stout 83 HP/liter and does it while weighing only 10 lbs more than the outgoing 4.6-liter, tipping the scales at 430 lbs. The best part is, according to Ford engineers, this design is "protected for future applications," meaning the block and bottom end are overbuilt and we'll be seeing much more coming out of this new mill. That supercharged iron-block 5.4-liter in the GT500 is getting pretty old, and all the kids seem to like turbos these days. Just sayin'. 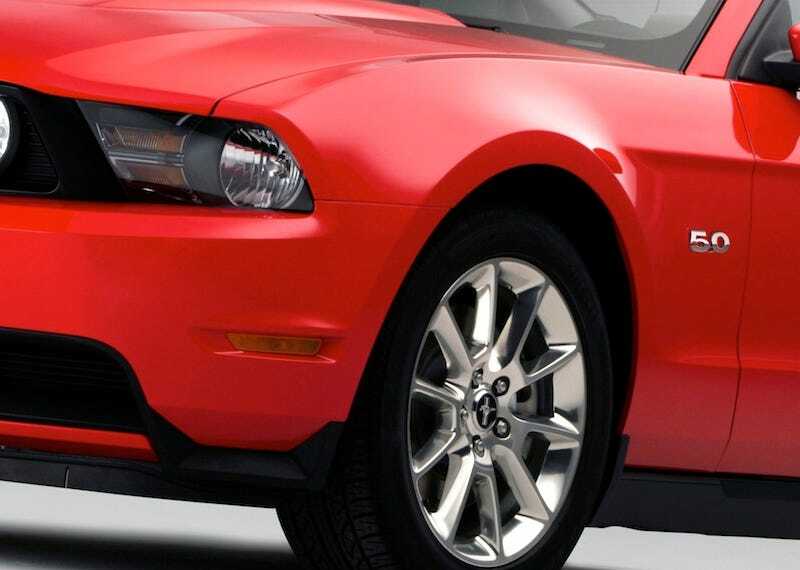 There are, of course, other improvements to the 2011 Mustang. The steering switches to Ford's Electronic Power Steering system. Like the V6 Mustang, the chassis on both the hardtop and convertible are stiffened with a combination of bracing and structural foam. There's a 14-inch Brembo brake option which requires new 19-inch wheels. The lower front fascia is tweaked for 2011, there are improved aero bits here and there, the gauge cluster gets a standard information center, there's a MyKey option, universal garage door opener and various other tchatchkies. None of these things will matter to the Mustang buyers who have been anxiously awaiting two little digits. 5 and 0.